Taxidermy is on an upswing. If you had to chart the overall perception of our profession to the general public, it would have probably started going downhill in the 1960s after Alfred Hitchcock’s “Psyco” and remained low for many decades. In the past twenty years or so, taxidermy began to enjoy a renessaince of sorts with high quality competitions leading the way. Taxidermy started showing up more in commercials, reality television shows, and on the internet. Interior designers rediscovered taxidermy and started using it to decorate millionaires’ penthouses. A revolution of new-age millennial artists became involved in expanding our perception of what taxidermy could be. I never thought I would see the day, but taxidermy is actually COOL now. And that is not merely my opinion. Just this past week, Elle Magazine published an article entitled “How Taxidermy Became Cool Again“. To an old-school guy like me, this is mind-blowing. And it is exactly what our industry needs to thrive and survive in the future. It wasn’t too many years ago that I remember taxidermists complaining that we were all a dying breed, and that we might be the last generation to hunt, trap, fish, or practice the art taxidermy. We have all seen how quickly the media’s control of the thought police can turn the social mores 180 degrees in less than a generation. Many traditional taxidermists have been reluctant to warm up to these new divisions of taxidermy art. From the plushy aficionados on DeviantArt, to the rogue taxidermy movement, to the steampunk genre, to other alternative artists who have created unusual anthropomorphic taxidermy, many of these displays have seemed disturbing, and even disrespectful to journeyman taxidermists who have made their living for years reproducing faithful, anatomically accurate representations of their customers’ hunting trophies. Additionally, the new buzzword of “ethical sourcing” for specimens has also been a point of contention, with some traditional taxidermists feeling like this is a backhanded way of painting legal hunting as somehow “unethical.” In some of the books on the new taxidermy art, the authors have cautioned readers that the Taxidermy.Net website, while a great resource for information, is not very welcoming to artists that are not traditional taxidermists. Just like muzzle loaders vs. bow hunters, we need to remember that are all on the same team and should not artificially undermine ourselves with self-imposed divisions. With this in mind, we need to embrace the new taxidermy art and welcome it into our fold. Part of that is reaching out with traditional taxidermy competitions. The World Taxidermy Championships® recently has had great success with a new “Interpretive Taxidermy Division” which allowed for more creativity than a purely naturalistic representation of a species would allow. The World show also has been the inspiration for new books published on the art of taxidermy, although these books are a far cry from the step-by-step “Breakthrough Taxidermy Manuals” which I helped write and edit thirty years ago. 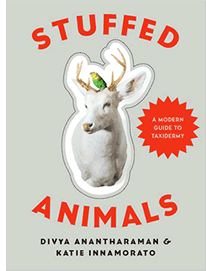 One of these excellent new books is “Stuffed Animals – A Guide to Modern Taxidermy” by Divya Anantharaman and Katie Innamorato. You can read an excerpt from the book here. When the book was launched last week in Brooklyn, New York, the authors were looking for a keynote speaker who could bridge the gap between the new age and the old school. Someone who could see the big picture and help to educate the younger artists with the lessons of American taxidermy history. And of course, there is only one person for that job, and he happened to live right across the Hudson River, ambassador John Janelli. John graciously agreed and put together his comments the night before. When he got to the event, he found the authors had been greatly inspired from the last World Taxidermy Championship. The audience was much younger and a bit stranger than the SCI crowds that JJ was used to giving speeches in front of. But they were extremely cordial, attentive, and intrigued by the taxidermy history that he presented. I was so impressed with his speech that I asked him if I could reprint it here for all to see. Authors Katie Innamorato and Divya Ananthartaman pose with keynote speaker John Janelli at the Acme Prop Studio in Brooklyn. Ladies and gentlemen, please know that I could not be any more honored to be here this evening than I would if I was addressing a thousand people at an international wildlife conference. The reason is very simple; all wildlife issues concern our industry, and rightly so. On the other hand, it is you – our taxidermists and patrons that matter the most to me. 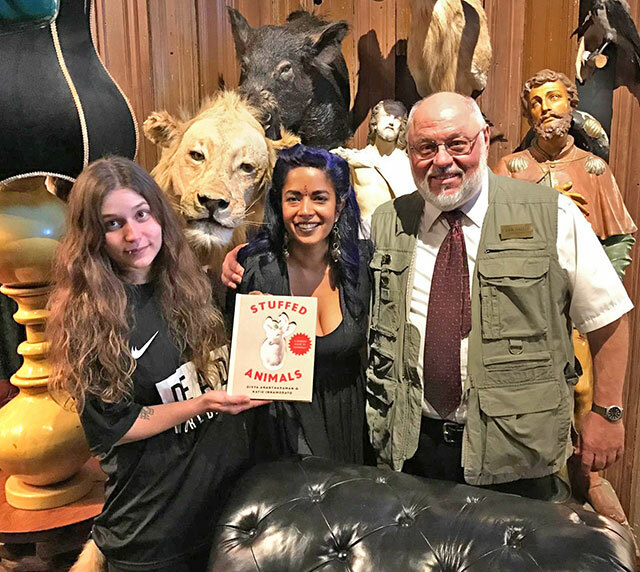 So much so that when I see such diversified young people draw themselves so close to taxidermy as to write books about the subject, it makes me so relieved to know that taxidermy has not just survived another generation, but that it’s thriving among us today. This is why I found it so vital to open your eyes now to a glimpse at “The Great Arc of American Taxidermists”, that spans well over 240 years of thought provoking innovation and almost space age technology. It was the gifted tenor Enrico Caruso who once said, “A person who cannot sing – and knows it, is like a breath of fresh air!” Let me warn you, not only can I not sing, I don’t understand a thing about chords and music either. Yet, I have written the words to more arias in our industry and with more passion than perhaps Rossini, Verdi and maybe even Puccini combined have ever done for the operatic stage. As American taxidermists, our great arc was forged in Philadelphia in the late 18th century by no less a national icon than Benjamin Franklin. He saw to it that in a small building on Walnut Street, directly behind Independence Hall, would be what is known as the American Philosophical Hall. Still there to this day, among other national treasures of early exploration and natural history, one can view some of the oldest works of historical taxidermy. For example, our national bird, the American bald eagle is stored there together with a pair of golden pheasants that were presented to General George Washington by General Marquis de Lafayette and the oldest mounted wild turkey resides there as well. The taxidermist was Charles Willson Peale who was born in 1741 and died in 1827. Although many other later taxidermists have taken credit for it, it was actually Peale who first combined artistically prepared wildlife with habitat accessories and painted back grounds in diorama settings. Also on display were hundreds of artifacts, bones, antlers, reptiles and documentations of authentic discoveries to accommodate each piece. The most significant being a nearly complete mastodon skeleton that was uncovered at a farm in upstate New York in 1801. This single relic of prehistoric importance bore solid evidence of something that was never completely understood or even thought of at that time – EXTINCTION! Now it became clear that animals did not have an infinite source of repopulating as was once thought prior to the mastodon excavation. It’s hard to imagine the grounds of our first State House just under the windowsills of the room where our Declaration of Independence was signed, being cluttered with boxes, crates, bales and cages full of North American wildlife brought back by the Lewis and Clark Corps of Discovery. Incidentally, it was Charles Willson Peale who painted the very first portrait of General Washington and also hand crafted the false teeth for President Washington from wood, porcelain and later, ivory. During this time, Benjamin Franklin had invited to Philadelphia a British taxidermist named Charles Waterton to either learn some new American techniques in taxidermy or to share some of his own breakthroughs with our Mr. Peale. It was a great idea, but it just didn’t work out. Even when Peale painted a most stunning portrait of Waterton complete with several examples of personally mounted bird specimens including a pedestal mount of Franklin’s house cat that spoiled for use in a full body mount, Waterton just wouldn’t warm up to American taxidermy. But, if there were ever a single person who novelty or ROGUE taxidermy could be said to have been initiated by, it would no doubt be Charles Waterton himself. He virtually loved doing this branch of taxidermy more than any other form of expression through carefully preserved and arranged body or skin parts put together to create a mind blowing sensation to those who would later pay vast sums of money to own them. P.T. Barnum was the largest patron for that sort of creativity in taxidermy. Not many years later, an incredible woman by the name of Martha Maxwell who was born in 1831 and died in 1881, became the first highly acclaimed lady taxidermist in our country. She is most certainly well deserving of her place in the great arc of American taxidermists to say the least. Here’s why…Martha wanted so badly to learn how to do taxidermy for herself. Sound familiar Ladies? To make a long story short, she found an old German taxidermist where she was living and literally begged the old timer to at least let her watch him at work in order to gain some insight on what taxidermy entailed. She persisted, he insisted saying NO. Finally, she got the old man out of his shop and home and literally took everything from the small cabin like building and said that if he didn’t agree to teach her, he would never see his belongings, tools, shop and house ever again. The little she finally did learn was soon replaced with her own more manageable way of doing the work. The use of bones and skeletons were eliminated and were replaced with welded structures of wrought iron, compliments of the village blacksmith, upon which she would wrap the excelsior muscles. She became so well known for her realistic taxidermy work that in 1876 she was asked to place on display over 1500 mounted birds and animals from the Rocky Mountains of Colorado where she was living at the time, over to Philadelphia for the centennial exposition of 1876. Martha was never given any recognition for any of her contributions to either taxidermy or science. Yes science, she discovered an entirely new species of screech owl that still most honorably bears her name; otus asio maxwelliae. Think how Martha Maxwell would have loved being here today with us to celebrate the work of Divya Anantharaman and Katie Innamorato in their new book; “Stuffed Animals – A Modern Guide to Taxidermy”. Ironic as it may sound, Martha isn’t really that far away from us at least in a mortal sense. Martha died far too young of ovarian cancer in 1881. She was living in a bath and boarding house she owned right here in Brooklyn, NY. It is my understanding that she was laid to rest in an unmarked grave also here in Brooklyn. If I had to make a dedication tonight for your book Ladies, it would be to Martha Maxwell. Moving to the summit of the Great Arc brings us to the Hudson River Taxidermist better known as John G. Bell, born in 1812 and died in 1899. Mr. Bell enjoys the distinction of having served John J. Audubon as primary field taxidermist for the great mammal expedition out west of 1843. Having prepared literally hundreds of specimens for Audubon to sketch and paint from, some of those still exist in several national museums to this very day. Much to Bell’s credit was also discovering a new to science species of sparrow bearing his own illustrious name to taxonomy; artemisiospiza belli. However, the least known of Bell’s repertoire is the fact that he personally was paid to teach taxidermy to a small boy from East 20th street in NYC who later grew up to become our 26th president, Theodore Roosevelt. It is nothing short of amazing at the amount of our industry’s history that occurred all within just a few minutes from where we are right now! Enclosed please find a brief and truthful account of the capture of the specimens which compose this group. The old bull, the young cow and the yearling calf were killed by yours truly. When I am dust and ashes, I beg you to protect these specimens from deterioration and destruction. Of course they are crude productions in comparison with what you produce, but you must remember that at this time (A.D.1887, March 7) the American school of taxidermy has only just been recognized. Therefore, give the devil his due and revile not. Rest assured, no other person did more to bring American wildlife conservation to the home front of law makers and law enforcers than Mr. Hornaday has. As the arc crests there was yet another professional taxidermist who brought to the world’s attention the disappearing wildlife of the so called Dark Continent – Africa. In fact, he did more to eradicate that description of Africa by simply writing his lifetime’s adventures in a book he affectionately called: In Brightest Africa. His name was Carl Akeley who was born in 1864 in Clarendon, NY and died in the Belgian Congo in 1926 while conducting photographic research of the mountain gorilla. Akeley saw such an imperative need of protecting this man like species, that he actually convinced Prince Albert of Belgium to secure the first wildlife sanctuary of its kind in the world, The Park National Albert. Even the National Geographic Society credits Akeley with being the impetus of the mountain gorilla’s safety through his first conceived conservation efforts. He proved that it was human encroachment to be the deadliest enemy of the once vast herds since the coming of the locomotive that would transport tens of thousands of people to and from the interior regions from the veldt to the jungles. During his career Akeley brought back the very best of what he dreamed of preserving for both the Field Museum in Chicago and the American Museum of Natural History in New York City. He quickly learned that by taking the very best artists, sculptors, painters and taxidermists right there into the realm of such spectacular wildlife and habitat, so much the better he could accurately portray that which he knew would one day be gone forever. These expeditions would also attract the rich and famous but none as endearing as Theodore Roosevelt. Together, Akeley and Roosevelt redefined African safari adventures. They blazed the first trails for generations of scientists and hunters alike. Today, their hunting exploits are still written about and published again and again in magazines and documentaries around the world. Carl Akeley is still respectfully known as the Father of Modern Taxidermy, but it was actually taxidermy that fathered him instead. And we know this because of the long paths of his adolescent days in Clarendon, NY that virtually took him from mounting songbirds and small game to a tremendous African bull elephant named Jumbo, and all before his twentieth birthday! But it was his endless love affair with Africa, where he constantly flirted with death itself to win the love of his life – Brightest Africa. He died there on November 17, 1926. Even the very earth could not hold down his remains for long. His grave site was desecrated sometime in the 1970’s during a bloody civil war which is really only a sanitary name for genocide. Just how he compelled those rebels to raise his bones is anyone’s guess, but for the most part, he’s up there still. His message and passion for wildlife conservation should be engraved in the hearts and minds of every American taxidermist who ever came after Akeley. For today it has become so critically important for our industry to be involved not just in preserving trophies or pursuing hobbies. Rather, in strategically preserving our wildlife heritage to ensure a long lasting sustainable future for all those who will come after us when we become … dust and ashes. This brings us down the slope of the arc that you must place yourselves upon. You do that by picking up where everyone else in my generation has left off. My generation has failed to have lifted the antiquated laws that prohibit all taxidermists from salvaging and utilizing accidentally killed species either in part or whole. Call them “road kill” or whatever else fits the description but the federal and state agencies call them “illegal” to possess for any purpose whatsoever, barring educational institutions with proper permits. But this still excludes rank and file taxidermists from picking up “road kills” for any personal reason. As they say, ignorance of the laws is no excuse, but knowledge of them certainly can be an encouragement to have those laws changed. Most of you here have extraordinary educational backgrounds and maybe even personal contacts with universities and colleges. Remember, there is no way that the United States Fish and Wildlife Service will allow anyone to possess road killed wildlife for commercial taxidermy purposes. That is to say, John Q will never be allowed to pick up protected or regulated species just to take it to a local taxidermist to have mounted for their home. But maybe, just maybe, someone in your generation could find a loop hole whereby THE ARTS can claim legal heir to having protected species to be used in all sorts of private taxidermy ART forms. For with these laws remaining unchallenged, it will only be a matter of time before Big Brother will be knocking on your doors, only to close them once and for all. There is no justifiable reason that should prevent taxidermists from utilizing a sustainable wildlife resource, when they are not purposefully killed. Make no mistake, until these often vague laws are changed, no one can legally use protected species or their parts for any private taxidermy intentions whatsoever. Not even rentals of legally gifted migratory game birds can be pursued. Nor can commercial use of captive raised migratory birds be legally conducted without first procuring a federal migratory taxidermy bird permit. I would be doing a major injustice to you if these facts were not made known now. For all of you in taxidermy is a very integral part of the Great Arc of American Taxidermists. Thank you for the incredible talk you did on Sunday! It means so much to have your vast knowledge, passion, and character present at such an event. It was educational and fun, you really brought the house down! I got a little misty eyed too! People have been sending messages saying that they had no idea how the history of taxidermy is so rich and intertwined with a larger story. There are really no words to express how grateful we are! Or how many people your meaningful words inspired. A millions thanks!